RI Flounder Fishing Charters on the Adventure Boat. Also known as Fluke Charters. Take a vacation in Rhode Island and enjoy the excitement and reward of a fishing charter with a knowledgeable local guide. Your whole family can join in! No experience required. 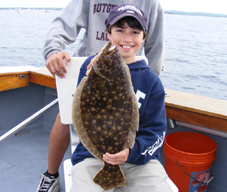 Let us take you on a family friendly Rhode Island Flounder fishing trip on our 33' Adventure. 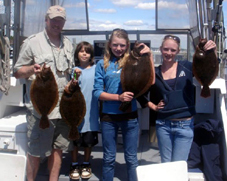 Fluke fishing charters are great for kids and adults or families on vacation in Rhode Island. 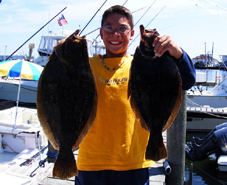 We do a lot of flounder trips during the fishing season in Rhode Island. Adventure Charters takes out a lot of families with younger children, and a half day flounder fishing charter is the perfect option for them. A charter boat, no matter how big it is, can be very restrictive for a child. If we aren’t catching fairly regularly kids get bored quickly. Flounder fishing addresses this because it is usually very good fishing and keeps them engaged. It’s also good for adults, because we catch big flounder the kids can’t always handle and the parents bring them in. Also, a half day is about the most both the parents and the children can take! We always go out of our way to make sure mom catches fish, too. In Rhode Island our inshore flounder grounds are very close to where the charter boat is docked, so the kids don't have to wait too long before we can fish (are we there yet). When flounder fishing you drift the fishing grounds with a flounder rig, which consists of a bait with some kind of lure, and a sinker to keep it on the bottom. It is important to make sure you are always bouncing the bottom, as you cannot catch fluke unless your bait is on the bottom. They will not normally come up after it. The bouncing of the sinker creates a noise that the curious and hungry flounder will come in to investigate, and the bait is something he wants to eat. If the client can feel the hit and lift the rod slowly, a nice fish can be hooked and brought to the boat. Flounder are so good to eat--much better tasting than striped bass, which are very plain. When the drift is slow it can be difficult to catch flounder, you need to cover bottom to be able to find and catch them. Also, they move around, so its necessary at first to find where they are hanging out before you can really get into them. We use braided line for flounder fishing. Its low stretch makes it much more sensitive for feeling hits and hooking fish, resulting in a shorter learning curve and more fish caught by our clients. Adventure also makes all of the flounder rigs used on our trips. We know how to find the flounder fishing hot spots. During the 2012 Rhode Island fishing season, it was not at all unusual to catch upwards of 20 fish per trip and our best day was 45 fish in a half day trip. Regulations allow us 6 fish per person at a minimum size of 18.5” long. That makes for an awful lot of fish to eat. Eight fish when filleted will fill a gallon bag with meat. Adventure will fillet and clean your catch before you leave the dock. Book a Rhode Island Fun Fishing Trip today. The O'Keefe family Fluke trip. Aiden proudly holds his big flounder. 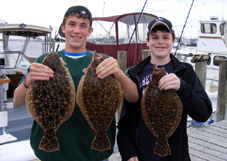 Young boys with their flounder. Adrian caught 15 flounder this day.